You are here: Home / Blog / Glass vs Plastic: Which is Better? Life is full of choices between two options. Coffee or tea. Coke or Pepsi. Chicken or fish. At Great Western Containers, we help our clients navigate the choice between glass vs plastic containers. Both have their advantages and drawbacks and in the end, it’s a little like choosing which came first, the chicken or the egg. The ultimate decision comes down to weighing both options and the context and making the right choice for the right product. The bulk of our inventory consists of plastic products and the sheer variety of containers, sizes and shapes made from plastic is this material’s greatest advantage over glass. These containers come in all sizes from the smallest plastic bottle holding just a half ounce to the largest IBC Tank that can hold more than 1,200 litres. Plastic containers can also hold a wide variety of materials. Food grade plastic containers can safeguard food products and liquids. Many of the smaller bottles work well for cosmetics and other products consumers only use a little of at a time. Certain plastics also work well for products that contain chemicals such as plant food, fuels and fertilizer. The ingredients in many of these more hazardous products require a container to maintain its integrity over the life of the product, which certain plastics can do. Plastic containers also have an advantage in shipping as well. They don’t break as easily as glass equating to fewer products lost in transport. While plastic containers certainly have a wide range of applications that make them a good fit for many products, they have downsides as well. The biggest downside to plastic containers is disposing of them. Plastics do not break down and biodegrade in landfills. Throwing away plastic containers means adding additional waste to the system. Further, containers that held hazardous materials can cause additional harm to the environment if consumers don’t dispose of them properly, such as through a hazardous materials collection site. Consumers can recycle most plastic containers and Canadians have been recycling more plastic lately. Recycled plastic gets turned into new plastic containers, building materials and even paint. Plastic seems to have a definite advantage over glass. However, glass still holds its own in this debate. First, glass works best for some products or has historically been the container consumers prefer. Take wine, for example. Most people would not buy wine in a plastic bottle. It’s not what they would expect and would seem a little strange. Additionally, some plastics can impart chemicals or flavours to certain foods and liquids. Winemakers make their reputation on flavor and would not want to compromise the flavor, even if it meant reducing breakage during shipping. Like plastic, glass is also reusable and recyclable so it can have a life outside of the landfill. Glass containers can be washed, sterilized and put to use again or recycled to make more glass bottles. And unlike plastic, it isn’t a petroleum-based product, which some consumers prefer to avoid. Glass has a few key detractors. First, it’s more expensive to produce and to buy. Secondly, it is more fragile making it prone to breakage during shipping. However, those risks often outweigh the benefit of glass for specific products. 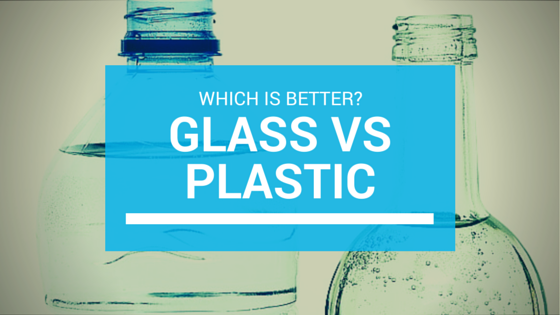 In truth, the question we should ask isn’t whether or not we should choose glass or plastic. The question we should always ask is whether or not the container is right for the product. Contact us at Great Western Containers to find out what container will answer your questions. I would prefer glass bottles as compare to plastic ones, because they affect badly on our body & environment.